Denver Public Works is looking to change its rules for construction permits, and the Mayor’s Pedestrian Advisory Committee is pushing the department to guarantee better conditions for pedestrians. Navigating Denver’s streets on foot can be a maddening experience, especially when sidewalks are closed for months and sometimes years at a time to make room for construction. While other cities have policies in place to minimize the impact of construction on the pedestrian network, in Denver detours routinely force people on foot to zig-zag through city streets. Now Denver Public Works is looking to change its rules for construction permits [PDF], and the Mayor’s Pedestrian Advisory Committee is pushing the department to guarantee better conditions for pedestrians. 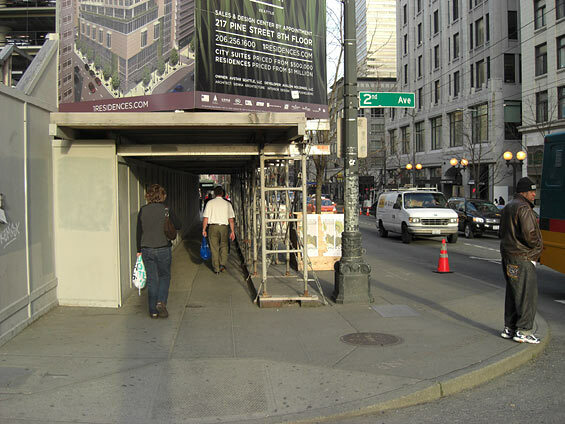 There is no city rule that prevents contractors from blocking sidewalks without providing a temporary walkway. Instead, builders simply pay the city a fee for a permit to block the sidewalk. The cost for the permit varies by neighborhood and time of day. While DPW says temporary walkways are “preferred,” the only incentive is a 10 percent discount on the permit fee. And that doesn’t even apply in the rapidly developing Central Business District or in Cherry Creek. As a result, temporary walkways during construction projects are rarer in Denver than other cities. People on foot don’t get to take direct routes — they have to go out of their way and make extraneous crossings. Or they take their lives in their hands, walking on the street next to speeding cars. MPAC Chair John Hayden laid out the group’s recommendations for the new policy in a letter to the streets department [PDF]. It lists seven demands, including a requirement for builders to include a direct substitute pedestrian passageway — made with Jersey barriers or “shed roof walkways” — by default. 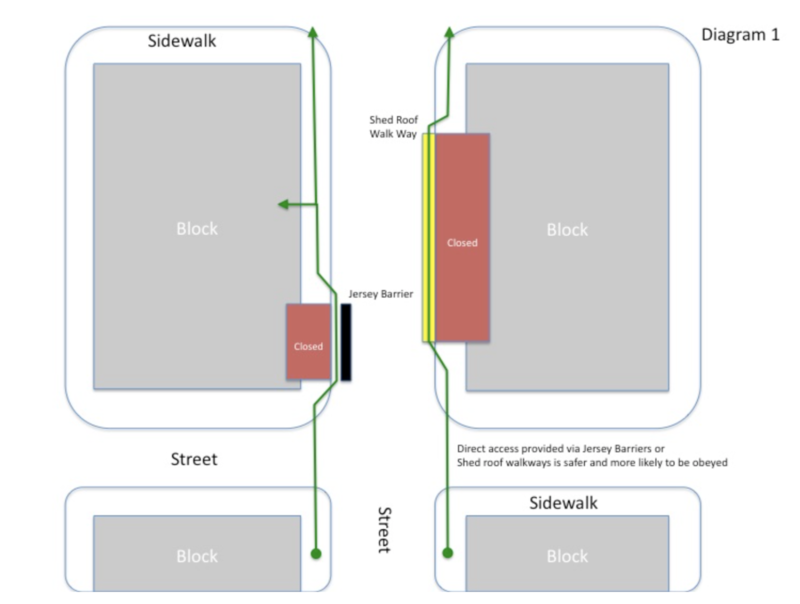 The letter includes diagrams showing how the city’s current policy obstructs pedestrian movement, and how the city should create continuous paths for people on foot, in wheelchairs, and on bikes. Is there a place to check these permits? Sometimes I see sidewalks closed long after work has been finished. 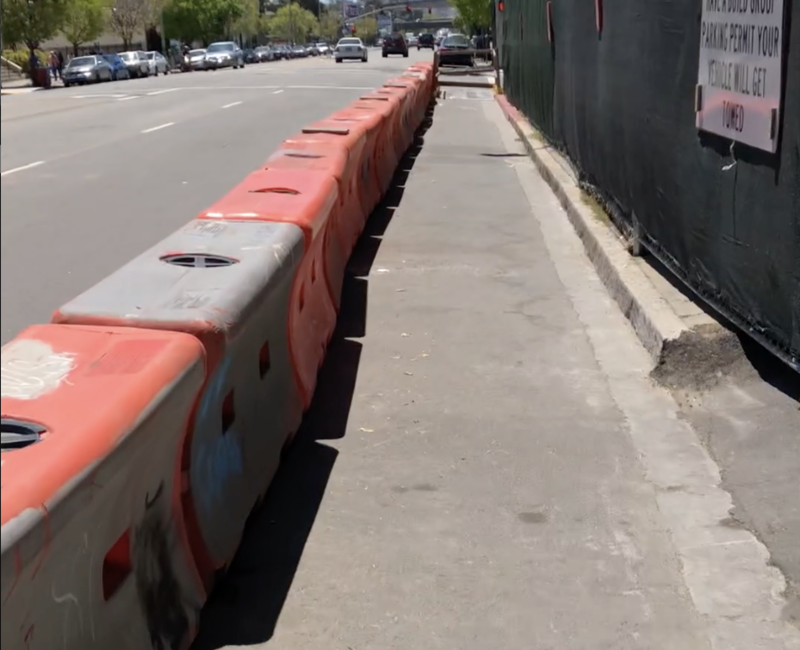 If the developers were actually paying for the required permits, I think they would be more concerned about reducing the amount of time the sidewalks are closed. My guess is they’re doing it without permits. It is also maddening to have bus stops blocked for construction. In many cases the next bus stop is several blocks away. If the city is serious about mass transit it should make sure that bus stops continue to be available during construction. Taking the bus is difficult enough already.